Chaz Davies will have surgery on his right collarbone next week in a bid to be 100 per cent fir for the next World Superbikes season. The Knighton-born rider bust his shoulder twice last summer but battled through the pain barrier to finish runner-up in the championship for the third time in four years to Jonathan Rea. Now after finishing the final day of winter testing for Ducati in Spain on Tuesday, Davies will go under the knife to sort out the issue. The 31-year-old will then have a few weeks to get fully fit ahead of pre-season testing resuming in January with the first race in Australia in February. And Davies is confident the new Ducati Panigale V4 R which he put through its paces at Aragon in Spain this week will help him take the fight to Kawasaki rival Rea in 2019. 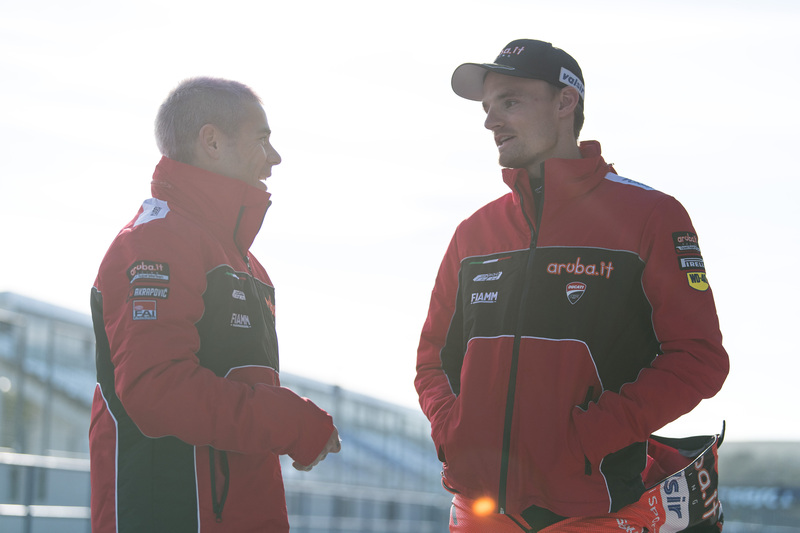 Davies finished fifth fastest in Jerez on Tuesday just fractions behind new Aruba.it Racing team-mate Alvaro Bautista who will make his debut in Phillip Island in February. “It was a positive test,” added Davies. “We learned quite a lot about the bike, and we have a better understanding of what we need to focus on during the winter break to improve the package. “We took several sets of tyres to race distance and also tried a new swingarm with positive feedback, but in general the main thing at this stage is to avoid confusion, and I think we have pretty clear idea of the direction we need to go in. “We have a lot of information to process, now we just need to put it together. Davies in discussion with one of his engineers in Spain. Davies has racked up four days of testing on the new bike with two days at Aragon followed by the two days in Jerez. On Tuesday he completed 62 laps finishing just over one second behind Rea on the time-sheets, though he has been focusing on adjusting to the new Ducati. Davies added: “It still feels like there is a mountain to climb on putting it together. There is so much information but it is about putting it together. “The potential seems like it is there but it is hard work between now and Phillip Island and even beyond Phillip Island and into next season. It needs to be hard work.